A family holiday at a lodge, log cabin or chalet offers something special for all the family. Many lodges are located in popular family hoiliday locations in both the UK and Europe. With a wide range of superb facilities there is something for all the family. 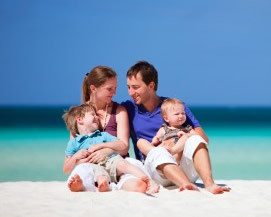 Holiday Lodges can make a perfect holidays for a family (large or small). They come in all shapes and sizes and can offer great holiday accommodation all year round. So... whether you are looking for a holiday for a young family, teenagers or an extended family holiday lodges really offer great flexibility and can be booked for parties of all sizes. If you have specific needs for your family holiday e.g. cot or stair gates please check when you book that these facilites are available on the lodge you are booking. Whatever you are looking for in a self catering holiday a holiday lodge can be an ideal solution. To search for a log cabin or lodge just use the menu down the left hand side. As you progress through the site you can narrow down your search to a specific town.